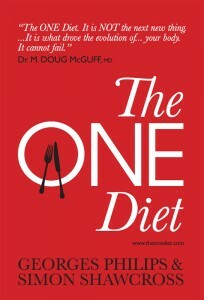 “The ONE Diet… is NOT the next new thing… It is what drove the evolution of … your body. It cannot fail.” Doug McGuff MD. Whether you need to lose a few pounds or a hundred pounds The ONE Diet is a phenomenon, the diet that works for everyone. Drive your weight loss success, with six simple nutritional steps that fit your genes, and an empowering psychology. The ONE Diet adapts humankind’s natural way of eating to today’s world to help you shed your excess fat easily. The Foreword, written by Dr. Doug McGuff MD co-author of Body by Science, explains how this creates the optimal metabolic and hormonal environment for weight loss. There is no calorie or point counting, weighing, measuring or cumbersome diet “rules” to follow. It is simply a diet based on extraordinarily good food, which everyone can enjoy. The ONE Diet shatters the myths and illusions surrounding weight loss and the diet industry and provides an essential “road map” to your ideal size. It is the antidote to your excess weight and your frustration. The ONE Diet explains the link between weight gain and the prevalence of a few health-compromising ingredients present in the modern diet. You will learn why most popular diets fail and which “diet” foods cause weight gain. The ONE Diet also focuses on the key psychological processes that determine your success. You will be able to improve the subconscious beliefs you hold about your body, with cutting-edge yet simple strategies, including neuro-linguistic programming. The co-authors reveal how stress may slow weight loss and provide the resources you need to balance your emotions for faster weight loss. You will quickly realize what underlying issues may be causing you to over-eat foods that cause weight gain, and how to address them.